What's the Healthiest Oil to Cook With? Wander down the oil aisle of the supermarket and you'll be swimming in lipid-based lingo, with modifiers like cold-pressed, extra-virgin, omega-rich, and superfood all describing a substance not known as a health food: fat. Isn't a fat just a fat, no matter the source? Fat not only adds flavor to your food, it plays a vital role in your health. "The reputation of fat as something ‘bad’ for you is completely out of date. It was a myth from the very beginning," says Bowden. "Fat is necessary to absorb vitamins A, E, K, and D, not to mention the full range of carotenoids. Fat balances hormones, gives us energy, cushions our organs, and blunts our blood sugar." In order to cash in on these benefits, though, you'll need to choose cooking oils based on two things: source and smoke point. 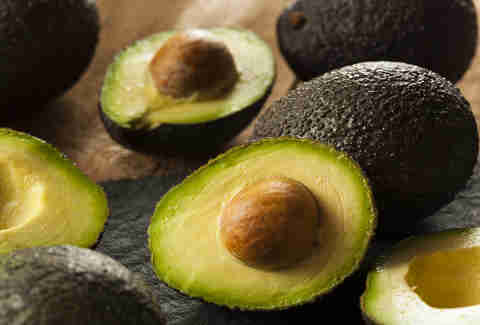 According to Dr. Masley and Bowden, there are good (smart) fats, bad (dumb) fats, and neutral fats. "Smart fats are of proven clinical benefit. They have been studied in humans in clinical trials and shown to provide real benefits," says Dr. Masley, who cites health advantages like reduced inflammation (an issue that causes accelerated aging) and improved insulin control. So you should go with olive oil and call it a day, right? It's never that easy; cooking preparation throws a monkey wrench into the whole equation. "It's important to mention that even a smart fat can be easily made into a dumb fat by cooking it at the wrong temperature," warns Bowden. When oil reaches a certain temperature (called the smoke point), the molecular structures of the fats form aldehydes, materials that cause an increased risk of cancer and heart disease when consumed or inhaled -- you can check out a list of smoke points if you're concerned about where you stand. 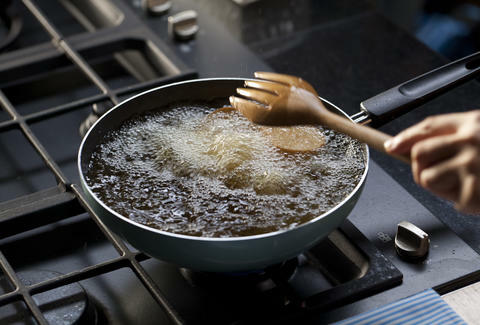 When you’re deep-frying, you need to select an oil that can withstand high heat. Canola oil, for example, has a smoke point of at least 400 degrees Fahrenheit. 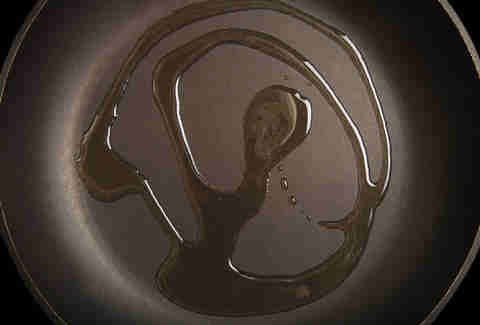 For sauteing, try virgin (not extra-virgin) olive oil or hazelnut oil. For drizzling on salads, any smart oil in your favorite flavor (walnut oil, anyone?) will do. When shopping for oil, prioritize smart fats, and always consider the oil’s threshold for heat. You should also think about incorporating cooking oils that have a higher ratio of omega-3s to omega-6s. "Refined omega-6s deserve an honorable mention in the hall of shame," says Bowden, referring to oils from corn and sunflower seeds. "While some omega-6 is necessary (it’s an essential fat), what makes it toxic is the amount we consume. We currently consume at least 16 times more omega-6 than omega-3." Ideally, consume omega-6 in a 1:1 ratio with omega-3. A well-stocked pantry includes at least three cooking oils: one for high heat, one for low-medium heat, and one for eating fresh. "Extra-virgin olive oil is fantastic for salads -- delicious and healthy -- but you can't cook with it," says Dr. Masley. "Avocado oil is great at high-heat cooking, but it doesn’t have much flavor." Enhance the flavor and the health benefits by splashing some sesame oil, coconut oil, or extra-virgin olive oil on foods cooked in avocado oil. As for which oils to leave at the store, Bowden offers some solid advice: "Avoid refined supermarket oils. Ease up on the corn, soybean, canola, and safflower oils, and start using more healthy saturated fats, like coconut oil, palm oil, or ghee. Use some omega-6 oils if you like, but make sure they're unrefined and cold-pressed. And always check the smoke point." Joni Sweet now claims that foods deep-fried in avocado oil are "healthy." Follow her on Twitter and Instagram at @JoniSweet.